On Saturday, June 4th, deputies from the Penobscot Sheriff’s Office responded to the report of a dog attack at a home in Corinna, ME. A seven-year-old boy died as a result of the attack. In the following week, there were numerous reports and interviews circulating through the mass media and social media discussing this tragedy. I was interviewed numerous times and what frustrates me as a Certified Dog Behavior Consultant is trying to respond to questions that do not have simple answers and that do not fit nicely in short sound bites. I truly believe that reporters and listeners do want to hear useful information that will help prevent tragedies like this from occurring again which is why, on June 9th, I interviewed Janis Bradley, a nationally recognized expert on dog bites and the Director of Communications & Publications for the National Canine Research Council. Janis is the author of the books; Dogs Bite, But Balloons and Slippers are More Dangerous, Dog Bites: Problems and Solutions, and The Relevance of Breed in Selecting a Companion Dog. 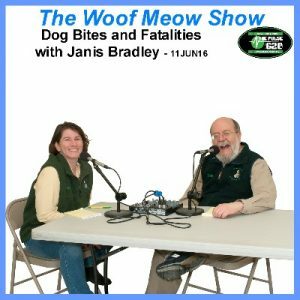 In the interview, which aired on The Woof Meow Show on WZON on June 11th, we discussed dog bite fatalities, how often they occur, common factors and how they can be prevented. We then addressed dog bites in general and why the statistics on this topic are not always reliable. We addressed whether or not the dogs breed is a significant factor in dog bites and attacks, it is not, and lastly; we talked about what people can do to minimize the probability of a dog biting. I encourage anyone interested in this topic and anyone who has been commenting on social media about this matter to listen to this podcast. Watch my blog www.words-woofs-meows.com and my column, Words, Woofs, and Meows, in Downeast Dog News (http://downeastdognews.villagesoup.com/ ) for future articles on this topic. You can hear The Woof Meow Show on The Pulse AM620, WZON, and WKIT HD3 at 9 AM every Saturday. If you are not near a radio, listen on your computer at http://www.wzonthepulse.com or your smartphone or tablet with the free WZON 620 AM app. A podcast of the show is typically posted immediately after the show, and can be downloaded at www.woofmeowshow.com and the Apple iTunes store.